Home » Uncategorized » Hosting a Party – and Gift Ideas! Hosting a Party – and Gift Ideas! My wife and I hosted two parties over the weekend. Hosting a get together is something we love to do. In fact, we love hosting people so much that this past weekend, we scheduled a Saturday night party, and a Sunday brunch party. Call me crazy (go ahead, now is as good a time as any) but I enjoyed every single minute of it! And now I am going to share the menu! For Saturday night’s dinner, I put together a mushroom dish as the appetizer which I have been working on for a long time. 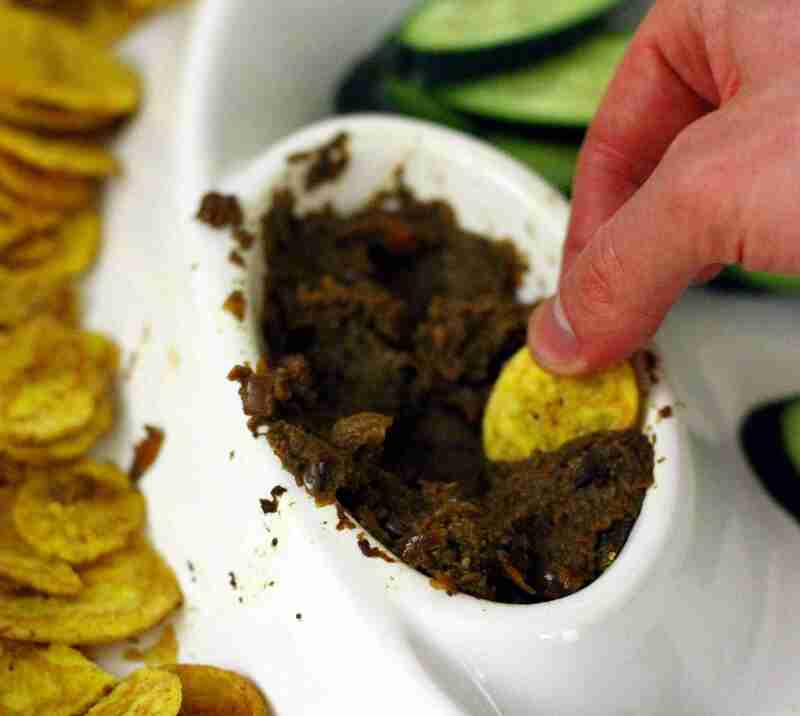 Here is the recipe post for what I ended up calling a Caramelized Sweet Onion Mushroom Tapenade. And believe me, it is every bit as good as it sounds! The mushroom tapenade in the recipe is the same one you see in the heading picture for this post. I served it with Plantain Chips, and what I like to call “Cucumber Chips,” which as you can see in the picture are just long-sliced cucumber which can be used as a dipping tool. Cucumber compliments the flavor of the mushroom tapenade nicely, adding just that hint of cucumber flavor. For the actual meal I made the Weekend Pot Roast post from last weekend, using pork rather than the beef that had had in mind when I wrote that post. As I suggested in the post, it worked just right for the pork. For the vegetables, I used medium sweet potatoes, “baby” zucchini, and young carrots sliced once. The baby zucchini came out amazing – the skin held some of the zucchini flavor in, while trapping the steam flavor from the pork in the rum marinade. The carrots and sweet potato came out as expected, and as I suggested in the original post, adding the sweet potato first, and then the carrots and zucchini later was just right. All of the vegetables cooked just the right amount, and the right amount of vegetable flavor seeped in to the pork. It was excellent! And for Brunch on Sunday I started out with a hand-made guacamole (I will post a recipe post probably tomorrow) with hand-toasted red and yellow peppers. Then, for a main meal, I made a Frittata with hand-toasted red and yellow peppers, finely diced carrot greens, and caramelized sweet onions. I served the Frittata with a side of bacon. And then for desert, I toasted ripe plantains lightly coated in coconut oil. It was a lot of work, and since I hand-wash my dishes (the dishwasher never does as good a job!) it was a lot of dish-washing! But it was oh-so worth it!! I would do it again this coming weekend if we hadn’t already made other plans. It has long been a tradition of mine to bring something specially cooked to my closest friends when they are hosting a get-together, having a party, or if we are just visiting. I don’t always have the time or energy to make a special dish, which will keep well, and bring it along – but I usually do! And now that I’ve mastered the Caramelized Sweet Onion Mushroom Tapenade, it will most definitely be the gift I will bring to my next event. Let me know what you like to bring your friends and family for special occasions in the comments section!